The online version of this article ( https://doi.org/10.1007/s11858-018-0962-0) contains supplementary material, which is available to authorized users. Mathematics teachers and early childhood researchers have probably observed children using their fingers in solving mathematical tasks or in daily interaction as when asked how old they are. Using fingers is, however, not only a child’s naïve strategy; many studies report that finger-counting strategies are widely used among children (Carpenter and Moser 1982; Fuson 1988) and aid also in counting larger numbers (Butterworth 1999). In most cultures, fingers and other parts of the body are used to enumerate and keep track of larger quantities, however, with large varieties across cultures in the ways numbers are expressed (Ifrah 1985). In a summary of finger-counting research, Moeller et al. (2011) point out evidence of a connection between numerical reasoning and finger-counting acts, even among adults who have moved on to mental strategies. Running counter to this evidence, there are also findings from Geary et al. (2004) and an early study by Neuman (1987) revealing that some school children facing difficulties with developing conceptual knowledge of number facts get stuck in cumbersome finger counting strategies. Ostad (1998) also reports on children with mathematical difficulties who rely on material strategies to solve arithmetic problems (using fingers and manipulatives) without internalizing them into mental strategies or number facts, as most children do while moving up through primary school. These contrastive findings point to complexities underlying finger use as means for learning to count and calculate that remain unexplored in the broader field of research. This complexity represents the gap that we seek to investigate. As Moeller et al. (2011) point out, there has been a lively debate about the role of fingers in the development of arithmetic skills between neuroscientists and mathematics educators. This debate has taken place, and is taking place, between those for the use of fingers, and those against it other than in very early stages. Butterworth (1999) put forward a hypothesis that the development of arithmetic skills, and mathematical capabilities in general, are closely related to the use of fingers. Much neuroscientific evidence has been presented in favor of this hypothesis (see for instance Berteletti and Booth 2016; Butterworth et al. 2011). In particular, it has been demonstrated that when engaged in mathematics, the region in the brain connected to the use of fingers exhibits considerably heightened activity, even when fingers are not used at all. The idea of the use of fingers as a key component in the development of arithmetic skills, has thus received a great deal of support from neuroscience research during the last two decades (see e.g., Berteletti and Booth 2015; Boaler et al. 2016; Moeller et al. 2011). 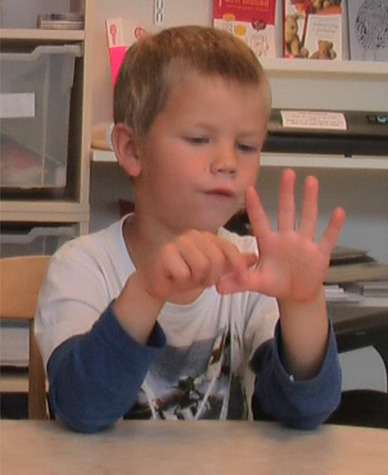 Within the field of mathematics education, there is a large body of research advocating counting to be a core ability for arithmetic skills development, with fingers used (and taught to be used) as counters for keeping track of counted units (Fuson 1982; Steffe 2004). A contrasting view is put forward by Brissiaud (1992), who advocates the use of finger symbol sets—without counting—in solving addition and subtraction problems, that is fingers are representing cardinal numbers. This debate concerns whether fingers should be used or not. What these positions fail to engage with is how fingers are used in relation to how numbers are experienced. 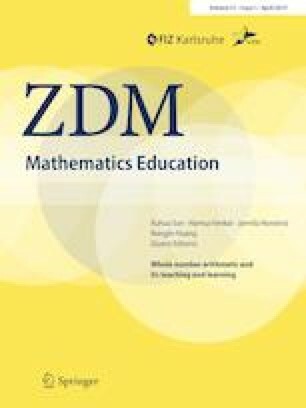 Thus, there is sufficient evidence to direct attention to finger use in arithmetic problem solving and in particular how different ways of using fingers affect computation success among children who have not yet been taught to use any arithmetic strategies in formal education. Different counting strategies are found in empirical studies of children’s arithmetic task solving and these are thoroughly described in the literature, such as “counting all” and “counting on” (e.g., from the first addend or from largest addend). However, Steffe, Thompson and Richards (1982) describe children’s different ways of counting as it emerges in the very early attempts to solve arithmetic problems, implying a developmental trajectory. This starts from counting with perceptual unit items where the counted items have to be present in order to be counted and the reasoning is perception-bound. This is followed by a more advanced way of counting figural unit items, in which the child’s counting is independent of the immediate perception and for example uses finger patterns to construct sets, without however, necessarily being able to coordinate successive steps in the problem-solving act. The third and most advanced way they describe is counting with motor unit items, such as extending fingers for counted items, as discrete units, and coordinating one set with another set as an extension of the first. To use so called motor unit items (fingers) successfully in arithmetic problem solving the child has to engage intuitive extension. That is, the counted fingers change from an ordinal meaning to a cardinal that can be extended by adding another cardinal set (which has been determined by counting unit items). It seems that the advanced way of counting is considered a precondition for many of the counting strategies that the field of research has studied. Carpenter and Moser (1982) give for example two possible ways of solving a subtraction task: If physical manipulatives (or fingers) are present, the larger quantity in the subtraction problem is initially represented and the smaller quantity is subsequently removed from it one unit at a time, equal to the given number in the task (a strategy they call “separating from”). By counting the remaining units, the child will get the answer. The other strategy based on counting (called “counting down from”) constitutes a backward counting sequence beginning with the largest given number and counting back as many number words as the given smaller number. The last number uttered in the counting sequence is then the answer. This strategy, counting backwards, requires the child to interpret the units counted both as parts of a sequence (with a specific relation to every other counting word) and a cardinal set to which each unit adds a particular value. Without the cardinal understanding of the counting words, a counting backwards strategy would not be efficient, according to Fuson (1988). Lately, it has been suggested that counting unit by unit does not necessarily promote children’s development of the conceptual structure of numbers, i.e. the part-part-whole relationship. Unitary counting may instead constrain children in one single presentation of a quantity when for example “counting all” (Cheng 2012; Murata 2004; Murata and Fuson 2006). There is however a dual approach to this: If the child relies on counting strategies only, she has to enact a double-counting strategy when encountering a subtraction task, which is a demanding method and rarely used by children (Fuson 1988). However, if the child recognizes the subtraction task as a structure, she may transform the subtraction into an addition and then apply the strategy of ‘counting-on’ the smaller given quantity and constructing the larger one as an additive action (Baroody 2016). Then counting the added units gives the answer, or, by keeping track of the number of words added/counted on the smaller given quantity (addend). Gray, Pitta and Tall (2000) conclude from multiple observations that children who are less able to solve arithmetic problems seem to rely extensively on counting procedures. Children who are skilled arithmetic problem solvers, on the other hand, seem to find plausible procedures almost intuitively (like the inverse relation between subtraction and addition). Operating on a conceptual level provides a flexibility that, according to Gray et al., is a marker for successful arithmetic problem solving. From educational programmes based on structural approaches, Schmittau (2004) also concludes that understanding numbers as composite units (part-part-whole, in contrast to sequential units alone) facilitates flexibility and mental de-composition strategies that are characteristic of conceptual understanding. Furthermore, children’s understanding of structural relationships within arithmetic tasks allows them to develop ideas about addition and subtraction, not as strategies but as a unit to operate on (Davydov 1982; Schmittau 2004). Changes to an arithmetical task’s result is then understood as depending on changes to its components. The difference from counting strategies based on single units is primarily the way of experiencing numbers as composite sets where the part-part-whole relationship is primary to the sequence of the numbers. Mulligan and Mitchelmore (2009) proposed that an awareness of mathematical structure is strongly correlated with general mathematical understanding. This is confirmed by Lüken (2012) who found that an early sense of structure at the beginning of formal schooling predicts mathematical achievements in Grade 2. Or in other words, children with a poor sense of structure are likely to achieve less well in mathematics in general. But as Mulligan, Mitchelmore, English and Crevensten (2013) have shown in their seminal work, awareness of mathematical patterns and structure can be taught in early childhood with significant implications for the development of number knowledge and arithmetic skills. These findings direct attention to the suggestion that children’s mathematical development is not merely based on knowledge about numbers, numeration, and quantities, but also on the sense of structure. Thus, it is assumed to be a general, task-independent, feature of children’s cognition in the early years that relates to the ability to fluently use unitizing, partitioning and re-grouping strategies. Within the literature about the development of counting skills, the use of fingers has been given a central role (see Fuson 1988; Geary et al. 2004; Steffe 2004; Steffe et al. 1982). When addends are larger than two or three (i.e. beyond the range of immediate perceptual apprehending of quantity), there emerges a need to represent the quantities, either by keeping track of the counted units, commonly by raising fingers one at a time, or as a finger pattern where fingers represent a composite set of units. The number words and the finger patterns constructed while raising one finger for each word are then matched to end when the pattern is produced. Some initiatives have been taken to describe levels of advancement in children’s use of fingers as an aid for solving arithmetic tasks (cf. Baroody 1987), where counting one finger at a time to determine a quantity develops towards recognizing finger patterns, which is said to ease the keeping-track procedure and eventually fingers become unnecessary when children learn number facts (Baroody 2016). Brissiaud (1992) has, however, advocated an alternative pathway to number learning, which is based on children using fingers without counting. Children then first learn to recognize the cardinal numbers represented as patterns or sets of fingers and then make use of these finger symbol sets in solving addition and subtraction problems. Siegler and Shrager (1984) describe this as one of several strategies for representing numbers to aid in such arithmetic tasks that the child cannot yet retrieve from memory. “Seven” would for example constitute a whole hand of raised fingers and two more finger raised on the other hand, forming a consistent whole that can be related to another finger symbol set (adding a set of two will make a set of nine, represented by the whole hand and four fingers on the other). This will in turn enable the child to compare numbers as cardinal values or as parts of a whole, without counting because the child recognizes the “two”, the “seven” and the “nine” as a part-part-whole relation. Fingers have a dual role in relation to counting: Children can use fingers to count with, when pointing at objects to be counted, or using fingers to count on, when fingers are the counted objects (Sinclair and Pimm 2015). Fingers may be used to represent any kind of objects, and thereby stand in between the concrete objects that are counted and the abstract concept of number itself. This helps children represent a quantity that is more abstract than the physical objects that are to be counted. Due to the semi-abstract representations that fingers entail, those children who count by extending fingers one by one or as finger patterns may furthermore be expressing an advanced form of problem construction, understanding and solution, if these actions are generated with the intention of counting in the absence of directly perceivable objects. This does, however, depend on the ability to maintain the essential distinction of how fingers are used, to keep track of a sequence of number words or to represent a cardinal set. What becomes critical is then the simultaneous experience of numbers’ ordinal and cardinal values, for example when adding on units to figure out a missing addend (“counting on”) (Davydov and Andronov 1981). As stated above, finger patterns include the use of fingers to represent numbers with cardinal value, but it is rather the relation between numbers that may be discerned through the finger patterns that becomes useful in arithmetic problem solving (Gattegno 1974; Neuman 1987). This relates to the previously argued benefit of children’s awareness of number structures, which includes abilities to recognize relations within and between numbers (Mulligan et al. 2013). Fingers as representations for number sets may thus help children in this process by their reifying the number structure. Gattegno (1974) points out the necessity of becoming aware of the part-part-whole relationship of numbers and gives instructive advice on how development of this awareness is facilitated by systematic use of finger patterns, closely related to the cardinal meaning of numbers. He concludes there are ten ways of showing one (of ten) fingers, 45 different ways of showing two fingers, and as many as 252 ways of showing five by unfolding fingers. But any one of the 252 ways of showing five fingers is verbally represented by only one number word. This both restricts the use of fingers to describe quantities, because if the cardinality is not experienced it is not possible to understand that different patterns represent the same number, and widens the opportunities to experience the variety of subsets as constituting one number. Gattegno (ibid.) claims that the act of folding and unfolding fingers may direct awareness towards the sets of folded-unfolded fingers, as each set of folded fingers corresponds to another set of unfolded fingers: when folding four (of ten raised) fingers, six fingers remain unfolded, and reversed, six folded fingers remain four fingers unfolded. Furthermore, the pair of complementary subsets may in this way be experienced simultaneously: “…it can now be brought out that since the folding of some fingers produces at the same time a configuration of unfolded ones, there must be the same number of subsets for two complementary cardinals” (Gattegno 1974, p. 6, italics in original). Based on the large body of research claiming that finger use in arithmetic development is essential and the lack of closer investigation in the effects of different ways of using fingers, we have conducted a study that will shed light upon the complexity of finger use in early childhood before children participate in formal mathematics education. The theoretical framework for the study is the variation theory of learning (Marton 2015). Originating from the phenomenographic tradition (Marton 1981; Marton and Booth 1997), the theory stems from more than 30 years of investigations of learners’ conceptions of different phenomena. In this study, the theory contributes a particular view of learning, seeing learning as experiencing. Learning something new is according to the variation theory of learning, to experience aspects of what is to be learned that have not previously been discerned, and thereby perceiving the world in a more differentiated way (cf. Gibson and Gibson 1955). A fundamental idea is that how a person experiences a phenomenon, e.g. a subtraction task, affects how she acts in regard to the phenomenon. How a child experiences the task has to do with what aspects of subtraction have been discerned simultaneously. Hence, if a child fails to solve a particular subtraction problem, there are necessary (critical) aspects the child has not yet discerned. Neuman (1987, 2013), who studied 7-year-old children’s experiences of numbers and early arithmetic using a phenomenographic approach, identified different ways of experiencing numbers, which was shown in different ways of using fingers. Her conclusion was that, differences in experience was related to differences in aspects discerned simultaneously. In sum, certain ways of experiencing (seeing) lead to certain ways of acting, e.g. ways of using fingers. In this study, we analyze children’s different ways of using fingers in solving an arithmetic task, using a variation theory framework. In order to gain knowledge about children’s experienced meaning, we identify what aspects of number the child is likely to have discerned, e.g. ordinality, cardinality, or the structure of the part-part-whole relationship. We report on a study of young children’s ways of using their fingers when solving an arithmetic problem, before they move into formal education with its associated teaching of specific mathematics and counting strategies. In Swedish preschool mathematics is not taught in a formalized manner. Although there are goals for mathematics learning, these goals are not specified on a detailed level and are primarily taught informally through children’s play. We share findings relating to how different ways of using fingers relate to successful solving of an arithmetic task. 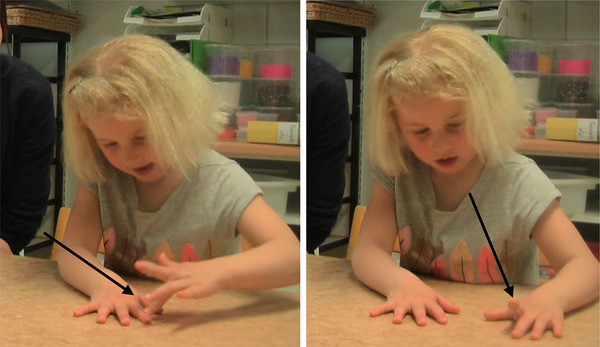 In our study, we explore 4–5-year-olds’ spontaneous use of fingers, and look for empirical evidence of what may be “critical” ways of using fingers in order to promote solving of arithmetic tasks. Our data consists of 126 observations of children solving one specific arithmetic task. The children were between 4 years 9 months (4:9) and 5 years and 8 months (5:8) old, (mean age 5:4). The data is part of a larger project (FASETT) in which video recorded individual interviews were conducted to gain knowledge of children’s number knowledge and arithmetic strategies. Nine preschools in three suburbs of a large Swedish city participated. Written consent was given by all parents/legal guardians for the children before participation. Ethical approval to use video documentation of children in the study was obtained from the regional scientific ethical board. Each interview lasted about 15–20 min and was based on an interview guide with mathematical tasks within the number range 1–10 (see Online Appendix 1a). During the interviews no numerals were shown, and no counters or similar objects were available. The tasks were given verbally only. Two researchers conducted the interviews. In a few cases we only had permission to observe and audiotape the interview. In these cases, one of the researchers conducted the interview while the other took notes as a complement to the audio recording. Fuson’s studies (1982) show that finger pattern constructs may be clear and visible among some children, for example extending fingers and looking at them, or very subtle (kinesthetical) among others. Children’s use of fingers is thereby challenging to study empirically. In some cases, the children used their fingers quickly, which made it more difficult to follow and interpret. Video documentations of the interviews containing both audio and visual data that can be re-played, do however allow us to thoroughly analyze both children’s utterances and gestures, even if they were sometimes very subtle. To answer the research question about how children use their fingers, we selected one of the 6 arithmetic tasks in the interview, “If you have 10 candies and eat six of them, how many are left?” for analysis (see Online Appendix 1a). This task was the only one with sufficient number of observations and rate of correct answers and was thus appropriate for our purpose. Although, task (a) and (c) had many observations (141/138 respectively) few where fingers were used. On task (b), (e), and (f) there were few observations and for (e) and (f) also few correct answers. The higher frequency of correct answers the analysed task compared to task (e) and (f) might be due to children’s familiarity with the situation (getting candies, eating some and having some left) and semantically this task was easier. This subtraction problem is of the kind Carpenter and Moser (1982) would call “separating”, in that a larger quantity is given and a smaller quantity is separated or removed from the initial one. The remaining quantity then has to be “found” by counting or other ways of experiencing it. The semantic nature of the task naturally models the action described in the specific problem, with finger-based direct models likely to lead to a counting-down-from-given strategy. Since we were interested in whether finger patterns were used by these young children, the task was feasible, in that the finger pattern 6 represented as one hand and one finger was likely to be familiar to the children. After we had separated those observations where the child did not give an answer or did not get the question, we coded the remaining observations for using fingers or not. Those observations where it could be seen in the video recordings that the child showed her fingers, either spontaneously or after being encouraged by the interviewer—“you may use your fingers if you want to”—were transcribed verbatim and included details of the movements with hands and fingers, and what the child looked at as she spoke or moved her fingers. Next, these descriptions were analysed together with the video recordings. Often a very close and repeated analysis was needed, since the child could very quickly fold and unfold the fingers. When searching for similarities and differences in how fingers were used, we looked carefully at how the child used the fingers, what was said, and her movement. Finally, each observation was coded for structuring the part-part-whole with finger patterns and/or counting fingers as single units. The different ways the children used their fingers resulted in 12 codes depending on whether the part, part and whole was counted in single units or was structured (i.e. either shown by folding or unfolding fingers). When, for instance, the whole (10) was shown (structured) as a finger pattern, and the given part was counted on fingers by ones (one to six), and the missing part (four) was shown as a finger pattern (structured), the observation was coded as S-C-S (S = structured, C = counted). (For details of the coding, see Online Appendix 1b). This coding gave us three distinct categories of finger use. In the following presentation we will relate these categories to the success rate of the task in elucidating how different ways of using fingers affect children’s arithmetic performance. In 12 of the 126 observations, the child could not give an answer, and 59 children did not use their fingers at all. In 55 (44%) of the 126 observations we found that the children showed fingers, either spontaneously or after being encouraged by the interviewer. However, in 13 of these observations, fingers were not used for calculation. The child just said a random number and showed the corresponding number, for instance answering “two” and showing the index and the middle finger. In the only case where a correct answer was given, the child said “four” and showed four fingers. Our interpretation is, however, that the child guessed. From Table 1 it can be seen that in 42 observations (33%) fingers were used for calculation. Our interest was in the 42 responses in which fingers were used for calculation. In the analysis of these 42 observations, we found that fingers were used for calculating the subtraction task in different ways. Three different categories of structuring the numbers (10/6/4) with fingers and/or counting single units with fingers were identified. Structuring parts and the whole with finger patterns. Structuring parts and/or the whole with finger patterns combined with counting fingers as single units. Counting fingers as single units only. It was found that the most common way (22/42) was not to count fingers as single units, but to structure the part-part-whole relationship with finger patterns (category 1). In 14 of the 42 observations, this was combined with counting single units (category 2). Only in six of the observations was counting fingers as single units observed (category 3) (see Table 2). In the following, details will be given about how the task was solved with the help of fingers within the three categories. From Table 2 it can be seen that in 22 of the 42 observations where fingers were used to solve the subtraction, this was done with help of finger patterns only, thus, without counting fingers one at a time. 18 of these gave a correct answer. The children could for instance, show the missing part, six (with one exception) as all the fingers on one hand and the thumb on the other. This finger pattern was used somewhat differently, however, when performing the subtraction. Some of the children started by putting both hands on the table, thus showing the whole (10) and, in some cases, also stated the number of the whole, saying “I have ten”. Next, they folded back all the fingers on one hand and one finger on the other hand and finally looked at the remaining raised four fingers, saying, for instance: “I ate six…. (folding six fingers)… (looking at the remaining raised fingers)…four” (Coded S-S-S). While these children showed the whole with ten fingers, others did not. They just showed the given part by folding six fingers down (whole hand and the thumb on the other), saying “ate six (looking at the remaining fingers) four.” One child held both his hands up, then he grabbed the thumb on his left hand, and said “four”. In this case, he did not raise and show either the ten or the six fingers. He just marked the given part with folded fingers and showed the missing part (see Fig. 1). Thus, all these children showed the given part six with their fingers and either folded them and raised the other four fingers, or kept the six fingers raised and just looked at the hand and immediately looked at the four knuckles and said “four”. Here the subtraction was solved by making the part-part-whole relation visible with finger patterns. Our interpretation is that the children experienced the finger pattern as a specific number; for instance, “This is six” (showing one hand and one finger). When starting with the finger pattern ten and structuring the two parts on their fingers (without counting them, but just seeing the numbers as finger patterns), the relation between the parts and the whole was immediately experienced and the missing part was found. Interestingly, in four of the observations it was found that even if the child could represent the numbers as finger patterns, s/he was not able to operate with them as a part-part-whole relation and come to the correct answer. In three cases, the child showed the given part six as a finger-pattern but gave the answer “five” or “one”. We interpreted these errors as resulting from not simultaneously experiencing the cardinal and the ordinal aspect of the numbers. The child shows the finger pattern six as five and one, but most likely without experiencing that six denotes all the fingers, not just the last (the thumb). In all these cases the number six was showed as one whole hand and one finger. However, when they started to model the eaten candies, thus “take away six”, they folded one of the six fingers. So, for instance, one boy shows six fingers with all the fingers on the left hand and the thumb on the right raised. He says: “Ate six (looks at his six fingers). This is six. And then I took the thumb away So, it’s five” (Coded 0-S-S). Similarly, one child folds down one finger (the thumb) and says “five”. Initially he puts both his hands on the table, and at the same time as the interviewer said: “And you ate six of these candies”, he folds four fingers on his right hand, so that all the fingers on the left hand and the thumb on the right hand (i.e. six fingers) are visible thus, he shows six with his fingers and simultaneously he looks at his left hand and says: “five” (coded S-S-S). In these cases, one of the six fingers, the thumb, was folded and when the remaining five was shown, the child answered “five”. Thus, they were coded similarly 0-S-S or S-S-S, but we suggest that the numbers were experienced differently than those who gave a correct answer. Taking away one of the six fingers and looking at the remaining five, could be similar to what is described in the literature as seeing numbers as names (Neuman 1987, 2013) or word tagging (Brissiaud 1992). Neuman’s interpretation is that a child can see number words as names given to the counted objects. The child points to the object and says: “one, two, three, four, five…”. So, even if “five” is the last uttered word, the child might not see “five” as denoting the whole set (cardinality). Instead “five” is seen as referring to the last counted object only. What was described above, taking away one (the thumb) of the six fingers and answering “five”, is a reasonable answer if the thumb is seen as “six”. This might be an indication of not experiencing the cardinal and the ordinal aspect of numbers at the same time. This is indicated also in another example, where the child answered “one”. In this case, after having showed all the ten fingers (“this is ten”), she folded all the five fingers on the right hand, showed the thumb and said one (i.e. the sixth finger) (coded S-S-S). This, we would suggest, is another example of the not seeing child that the same number word can denote cardinality and ordinality. 14 of the 42 observations were coded for finger pattern in combination with counting single units. This means that the given part six was either counted or shown as a finger pattern. In 12 of these observations the correct answer was given. The most common (in 10 observations) was to count the given part six on the fingers one at a time, and next either raising the remaining four fingers or just looking at the knuckles and saying “four”. Thus, the missing part four was experienced as a finger pattern, as in the following example. (Starting at the left-hand thumb) One, two (index finger), three (middle finger), four (ring finger), five (little finger) six (thumb right hand). (Five fingers on right hand and the thumb on the right hand are raised). Four! (Looks at the folded fingers on the left hand). How did you know so quickly? Look (points to folded fingers on the right hand) two and two, four. (Coded 0-C-S). Our interpretation is that the child did not count the four fingers one by one, but rather could experience the folded fingers as a set of four. Also, he explained to the interviewer he did not count the fingers one by one, but said he saw the folded fingers as two groups of two. Those who counted the given part six and showed a finger pattern for the missing part (four) could either combine this with a finger pattern for the whole (10), counting the whole or not showing the whole ten at all. It was almost as common not to show the whole at all, as to show this with a finger pattern, thus, showing the whole was not needed. One child showed six as the right hand and the thumb on the left hand and said: “That many I have eaten”. Next, she raised the remaining four fingers on the left hand and counted them: “One, two three, four. Four!” (Coded 0-S-C). You had ten candies and ate six. (Puts up one finger at a time, starting with the little finger on the right hand continuing on the left hand). One, two, three, four, five, six, seven eight, nine, ten. (Starting on the little finger on her right hand, putting up one finger at a time until the whole right hand and the little finger on the left hand is raised) One, two, three, four, five, six. This [six fingers] is that many (turns to the interviewer and shows her hands). Yes and how many were left? It’ll be …. (raising the four folded fingers on the left hand), it’s that many. Which do you mean? These? (points to the four raised fingers? How many? Four! Cause, look (pointing to her fingers), one, two, three, four. (Coded C-C-S). When counting the fingers as single units (first the whole and next the given part) the part-part-whole relation seemed to become visible for her and the missing part was immediately experienced as four. In two of the 14 observations, incorrect answers were given. In one of the cases, “three” was the answer. The child shows six as one hand and the thumb but counts on (quietly) from six (seven, eight) thus, she does not seem to realize that after having said “six” (i.e. the given part), she must say “one” when raising the index finger to find the number of the missing part (coded 0-S-C). She seems to be confused after having said “eight” and looks at the remaining two fingers (ring and little finger). Perhaps she realized that if she continues (nine, ten) the answer would be “ten”, which could be the answer. This we conclude from the hesitation, touching and looking at the fingers. Our interpretation is that the child experiences the sixth counted finger (the thumb) as six, not that six denotes the whole set of fingers. Thus, this is similar to what was described above; seeing numbers as names or word tagging. When the child experiences the ordinal aspect of the number only, the part-part-whole relation (10/6/4) is not visible to see. As was said before, the finger pattern for the number six was commonly shown as one hand and the thumb on the other. In one case, where an incorrect answer was given, however, another finger pattern was shown: four fingers on one hand and two on the other. The child raises ten fingers and looks at them, saying: “ten…how many did I eat?” “Six”, the interviewer says. Now, he holds four fingers up (all but the thumb) on the right hand and the little and ring finger on the left hand. Thus, the finger pattern for six is in this case 4 + 2 fingers on two hands. He finally says, starting to count the raised fingers. “That is one, two…..six. Six!” and answers “six” (coded S-S-C). It appeared that the child could not differentiate the visible part (six unfolded fingers) from the invisible part (four folded fingers) in the complex pattern that was constructed. Interestingly, it seems like he can show the whole hand and thumb for six; he shows this at the beginning, but then changes this to another pattern. One interpretation could be that he shows the numbers in the task (i.e. 10 and 6) but cannot see the relation to the missing part. This may be due to that the missing part is structured as a pattern that is not recognized (i.e. four fingers folded on two hands as 3 + 1). This example suggests that, even if counting fingers as single units is done twice (whole and given part) and the missing part is structured, the part-part-whole relation is not necessarily experienced. In six of the 42 observations fingers were used for calculating the missing part. These were coded as counting fingers as single units only. In all of these only incorrect answers were given. Thus, using the fingers in this way did not seem to help these children to find the missing part. In one observation, the child just counted, first the whole and then the given part (i.e. the numbers given in the task) on the fingers and when asked how many there were left, answered: “Don’t know. Don’t remember.” (coded C-C-0). In the other observations the children tried to find the missing number, either by counting in ones down from ten or counting on from six on their fingers and either answered “five”, “seven” or “ten”. It is obvious that the child counts on from six, but instead of saying “one” when lifting the index finger (see Fig. 2), she says “seven” and continues counting “eight…”. This is done twice. It can be noted that, after having counted to six the first time, she counts from one to four, but does not accept four as an answer. Instead she tries again, and this time gives the answer “ten” (coded C-C-C). Our interpretation is that, to her, for instance the index finger, is “seven”. When she counts the first time she first continues with seven after six and next tries to count the counted fingers (i.e. the four fingers after having said “six”) but changes her mind when having said four. We cannot know for sure why, but since the second time she says six, she continues “seven, eight….”, it is reasonable to assume that fingers’ connection to names seems to be strong for this child. Whereas in this case the last uttered number word was given as the answer, in the other cases (when five or seven was given as an answer) the number word following the last uttered number word was given as the number of the missing part. For instance, one child initially counts to ten by raising one finger at a time, holds up both hands and says: “this is ten”. Next, she unfolds the thumb on the right hand saying “ten”. She continues “nine, (folding the index finger) eight (middle finger), seven (ring finger) six (but without unfolding the little finger) five (unfolds the index finger on the other hand)” … and answers (loudly without looking at the hand) “five!” (coded C-C-0). It can be clearly heard and seen from the recording that “five” is said when the last finger is unfolded. It can also be noted that the child does not look at the unfolded fingers, she just says “five”. In our interpretation the child counts down to six and says the following number in the sequence and thus, the part-part-whole relation is not experienced. This is also found in one observation where “seven” is given as the answer. Initially the child says she does not know, but when encouraged to use her fingers, she folds the fingers, one at a time, and counts: “One (thumb), two (index finger), three (middle finger), four (ring finger), five (little finger), six (thumb on the other hand). Seven!” (said loudly and with emphasis, but without unfolding the next finger or looking at the hand) (coded 0-C-0). Our observations derive from 4 to 5-year-olds who have not begun to take part in formal mathematics education or systematic teaching of finger counting other than what parents and adults normally do in daily interaction with children. The literature brings to the fore a strong view that children commonly use fingers when encountering arithmetic tasks and thus it was surprising to find that only in 44% of the observations in our study were fingers used in one or another way. Since more than half of the children in our study did not choose to use fingers or seemed not to realize that fingers could be used for representing and manipulating quantities of other objects, in this case candies, our study suggests that finger use for problem solving is not necessarily a ‘natural’ phenomena that all children engage in spontaneously. Our aim was to contribute to the discussion on finger counting in early childhood by elucidating different ways of using fingers in solving arithmetic tasks. In our study, we find similar strategies for dealing with arithmetic tasks among young children as those earlier described in the literature (Baroody 1987, 2016; Brissiaud 1992; Carpenter and Moser 1982; Fuson 1988; Siegler and Shrager 1984), that is, both counting single units to determine sets and creating finger patterns and directly structuring finger patterns as cardinal sets in a part-part-whole relation. Our findings stand somewhat in contrast to the dominant field of early arithmetic development that holds that counting is foundational for arithmetic skills, with development building on advancements in using counting strategies (finding pathways by “counting on” or “counting from largest”) (e.g. Baroody 1987; Fuson 1988). We not only describe the different ways children use fingers, but also analyse why some strategies are successful, and when seemingly similar strategies are used, why some children do not succeed in giving correct answers. Thus, for example in two observations where fingers are used to construct a pattern of six and the child grabs the thumb, the first child experiences the thumb as the sixth finger, and when taking that away five have to remain, while the other observation shows how the child by grabbing the thumb emphasizes the cardinal meaning of six and answers that four remain (seeing six, four and ten as a part-part-whole relation). Our general claim is therefore, that studying finger use per se is not enough there is a need to thoroughly consider children’s experienced meaning in the strategy used. We have observed 42 instances of finger use and in 20 of them children count single units, partly or solely. However, six of these were coded for using fingers for counting single units only, (i.e. counting the fingers one at a time) and in none of these observations was a correct answer given. The other 14 observations where children were counting single units differ in one important way: they are combined with a structuring approach in which children in most of the instances flexibly change between ordinality and cardinality in their finger use, producing a structure on their fingers that support them in solving the problem. In 22 instances, structuring only by finger patterns were observed, and this produced a very high rate of correct answers as well. In the literature base, finger patterns are highlighted mainly as being a means to know when to stop counting or keeping track of counted items (Fuson 1982). However, our results show 36 instances (86%) of spontaneous use of finger patterns and the success in solving the task seems to be associated with ways of structuring the task as part-part-whole relations, represented with finger patterns (71% correct answers in category 1 and 2). This is also consistent with Siegler and Shrager’s (1984) study. These results, and in particular category 3 where children count single units only with no success in solving the problem, strengthen the suggestion made by Murata and Fuson (2006) and Cheng (2012), that unit counting only, may restrict children in experiencing the necessary part-part-whole structure of arithmetic tasks. The close analysis of reasons for children’s answers to the subtraction task reveals distinctly different ways of experiencing numbers, which have a clear connection to the correct or incorrect answers given. Based on our observations, we propose that there is a strong relation between experiencing numbers’ part-part-whole relations and showing structured finger patterns, since this seems to provide an opportunity to see cardinality and ordinality simultaneously, in the task given. The necessity of awareness of numbers’ cardinality and ordinality is not new (see Davydov 1982; Davydov and Andronov 1981; Fuson 1982), and Steffe et al. (1982) described this dual meaning of numbers in terms of intuitive extension. However, the empirical findings in this study suggest the necessity of simultaneous experience of cardinality and ordinality. By structuring numbers as finger patterns with ordinal and cardinal meaning appearing simultaneously, the child does not need to engage in first counting to determine the quantity of a set and then change to adding another counting procedure to the first set (which then has to change into a cardinal set). Our study shows empirically how the lack of cardinal awareness (category 3) is a stumbling block and hinders children from making use of numbers’ structure even though they may very well construct sets by counting single units. We would suggest that being aware that the same number word can denote cardinality and ordinality is a prerequisite for being able to experience the part-part-whole relation, e.g. 10/6/4. Obviously, in six of our observations, the children were not aware of this, and were therefore unable to perform the subtraction. When numbers are experienced as word tagging or names, the part-part-whole is not visible, independently of whether the numbers are shown as finger pattern or are counted. Numbers as names are identified both in category 2 (when incorrect answers are given) and in category 3. We would therefore suggest that using finger patterns for structuring numbers (cf. Gattegno 1974; Neuman 1987), might facilitate the experience of numbers’ part-part-whole relation (cf. Mulligan and Mitchelmore 2009; Schmittau 2004), which merely counting might not make explicit in the same visual way (cf. Brissiaud 1992; Cheng 2012). The field of research agrees on the necessity to develop abilities to fluently handle the relation between parts and whole (Baroody 2016). It is thus of pedagogical value to better understand how children create and experience this relationship, for example with the aid of finger patterns. Our study reveals some of the complexity that are important to recognize, not least as some ways of structuring numbers will not facilitate children in experiencing numbers and arithmetic tasks. Our study is a thorough analysis of ways that certain children use fingers. The study concerns one subtraction task, which limits any claims about children’s arithmetic skills on a more general level. The numbers used in the task might also be easily recognized as a full set of finger patterns, which does not reveal the complexity of other sets of numbers. Further studies are needed to verify the strategies in different number combinations, particularly over ten. Nevertheless, the task in itself provides an opportunity to analyse what different ways of using fingers in problem solving entails in questions of how to perceive numbers and basic arithmetic principles such as part-part-whole relations. This study thus contributes to the ongoing discussion on finger use and shows that it is not a matter of whether fingers should be used or not, but how fingers can be used to support and facilitate learning to solve arithmetic tasks. This study was funded by the Swedish Research Council (Grant No. 721-2014-1791).